Part 2 is all about the 1950's. Another iconic era of design and nostalgia. 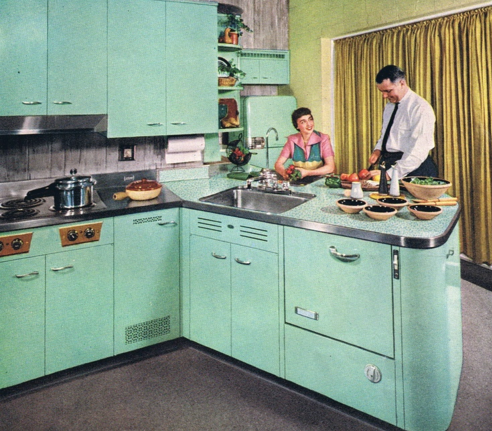 The driving force behind the kitchen design of the 50's was the post war consumerism. Economies were booming, a new generation of women were becoming wives and mothers, and everything was about convenience and enjoying life. People wanted their homes to be fashionable with the latest trends in design. They also wanted the newest technology to simplify their lives. Open plan living was introduced as middle class families became focused on entertaining in the home. Custom fitted kitchens with inset appliances became a must have. And, of course no kitchen design was complete without an absolutely enormous fridge. Homes became smaller after the war, so furniture had to stack or be light enough to move about; trolleys, sofa beds and ironing boards are all 1950s inventions. 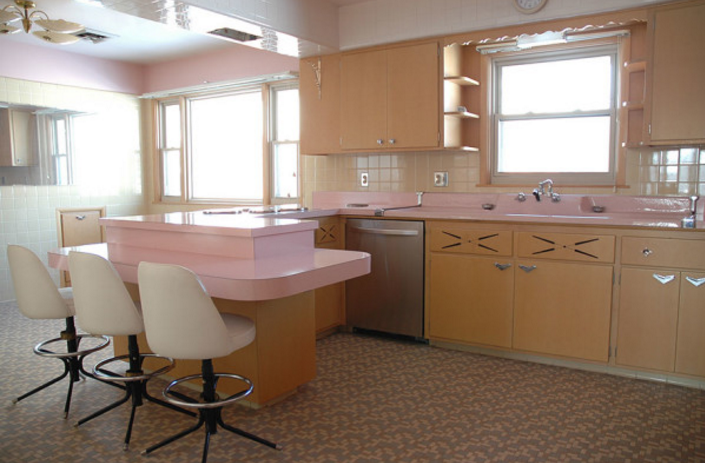 There are several kitchen designs to choose from: the American diner look with bubblegum colours, neon and kitsch, or the designer look with furniture and textiles. All these choices had visually striking elements to them that still catch our eye today. This is also when we start to see the floating island that has become one of the most popular kitchen design choices today. There were many influences with the colour and design such as animal prints, geometric or science inspired patterns, and new textiles that were not available before. The 1950's is when we saw the arrival of the colour pink in full force. Pink wasn't just about being pretty, it became a status symbol to women of the time. 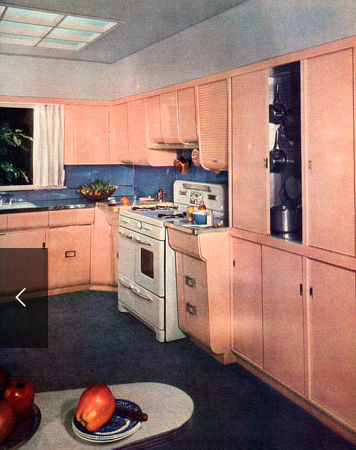 You were doing good when you had a pink kitchen or pink car. Not to mention chrome, enamel steel cabinets, and stainless steel countertops with warm wood colours and surfaces was a hot ticket look. A few of the other design elements to appear at this time were cabinets on top of the fridge, frosted glass, exposed brick, and decorative kitchen decore. This is also when design choices started to be considered for the home as a whole. The kitchen often opened into another area and women wanted each room to tie together in it's style. You weren't going to have a fabulous sitting room and a dingy, bland kitchen. The 1950's kitchen is really where we see the demand for convenience meet the desire for style, and as a result many beautiful design elements emerged which are still popular today. There are many ways to use these design choices in you current kitchen remodel. 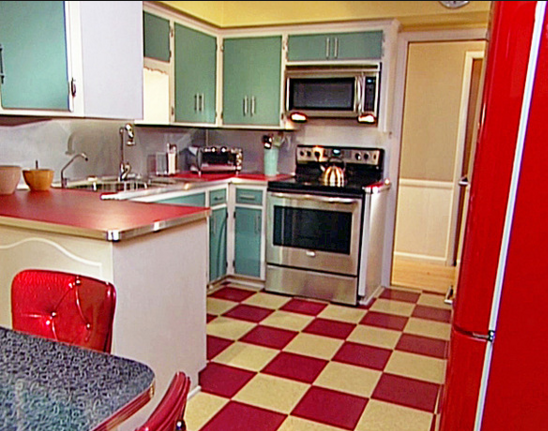 The iconic checkerboard flooring is striking and particularly updated when done with tile. The diner style is a classic with a shining red countertop and modern countertop seating. Then there is always that beautiful blue and other fun colours for your cabinets or appliances. The trick is to pick your feature elements that you love and then build out from there. If you go with all of them you may end up with more of a museum then a modern kitchen with retro elements. But hey if that's your style, then go nuts and have a blast from the past. Alchemy Renovations is happy to help create the kitchen of your dreams and we love working with customers who have an eye for the unique.